It doesn’t just look bizarre, it feels bizarre. The manual gear-change is a four-on-the-tree arrangement; I think the last car I drove that had a gearshift like this was a mid-1970s Japanese light truck. 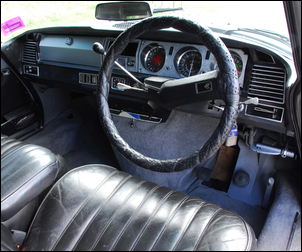 Despite having power steering, the steering wheel is huge – but the wheel has only one spoke! The space for feet is cramped, the accelerator pedal is just a thin piece of metal and the brake pedal – well, the brake pedal doesn’t exist. Instead, there’s just a rubber pushbutton. 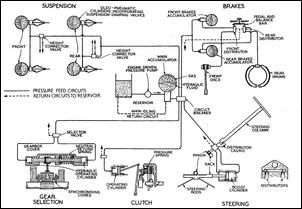 At least the clutch pedal is conventional! I start the engine – normally, with just the turn of a key – and the engine lumbers into life. It’s quieter than I expect – than anyone would expect, given that it protrudes a quite incredible distance into the centre of the cabin. But it’s no smooth, state of the art design – it feels like an old fashioned engine, even in this car that’s 35 years old. The handbrake is an odd affair – but with it released, now it’s time to get moving. I engage the clutch and roll off, moving up through the gears. Within metres the path takes us across a steep driveway and then a bumpy entrance to a road – except there are no bumps. Even considering the massively tall profile tyres (try 80 series...), the lack of impact harshness across the step is impressive. The windows are down – there’s no air-conditioning in this car and heat from the very close engine makes its way into the cabin – but it’s already obvious how well the car cruises, drifting along on small throttle angles and with the engine noise settling down to a (relatively) quiet voice. Onto the main road now, one that I drove only half an hour earlier in my own car. But I remember the road as being of patched bitumen, a typically poor secondary road with lots of short, sharp bumps overlaying long waves. In this car, there is simply none of that – we could be driving along the very best, newly laid surface... an airport runway in fact. The ride comfort – helped by the so-soft seats – is staggering. The ability of the suspension to absorb bumps without passing any vertical acceleration onto the occupants is simply the best of any car I have ever driven. But what about pitch? I brake – pressing that absurd mushroom just a fraction of an inch – and the car slows strongly, surprisingly staying relatively level. I accelerate – not that there’s much power to accelerate with – and again there’s a lack of pitch. Hmm, but what about cornering? An empty, tight suburban roundabout beckons – and there the car shows its engineers were still human. The car has just astonishing amounts of body roll – laughable, stupid, ridiculous, ungainly, disconcerting, madness. 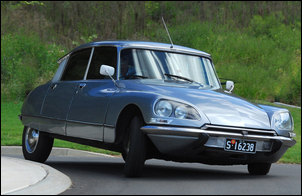 It’s a fascinating car, this Citroen DS. Literally like nothing else I have ever seen, touched, sat in or driven. 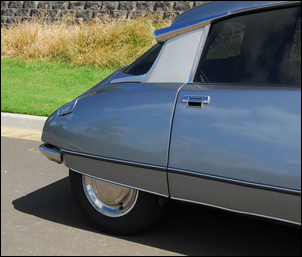 The Citroen’s bodywork was shaped for low aero drag and was carefully designed to provide huge interior space. (In fact, along with the ride, it was interior packaging that impressed us most about the car we drove – there was so much room in the front and back seats, and the boot, that modern car designers should hang their heads in shame. Or maybe put the engine halfway into the cabin!) A very stiff underbody pressing was used – the roof took little if any structural loads and was made from plastic. Doors were pillar-less. But not only was the body groundbreaking, the car ran a hydraulic system of amazing sophistication. An engine-driven hydraulic pump provided high pressure oil that was used to provide fully hydraulic suspension front and rear, power the steering, power the brakes and power the gearbox change – the clutch action being hydraulically provided. There were also inboard disc brakes on the front, rack and pinion steering, front-wheel drive and fully independent, self-levelling suspension. The front suspension used wishbones, the rear trailing arms, and both ends had (apparently inadequate!) anti-roll bars. 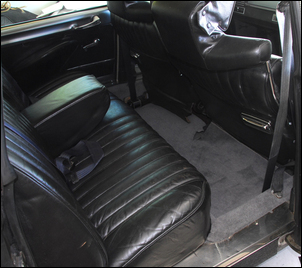 The ride height could be varied by the driver operating a lever. Cutting-edge Michelin X steel radial tyres were fitted. Only the engine was utilitarian: a small pushrod four cylinder with an alloy head developing 75hp at just 4500 rpm. 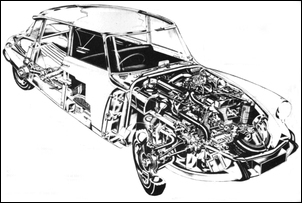 A 3.7 litre air-cooled flat six had been on the drawing board but it didn’t make it into production. No wonder: the cost of producing such a complex car must have already been mind-boggling. The engine was mounted north-south with the gearbox ahead of the engine. The public acclaimed the design – the impact it made at the Paris motor show was said to have been “quite staggering” but the motoring magazines sounded a note of caution. It is difficult to assess at the moment what sort of reception the car will receive. It is bristling with ingenious features, but they are, of necessity, rather complex, and the maze of hydraulic pipes with their circuits, dependent upon one belt-driven pump, may result in apprehension on the part of would-be purchasers, and this might affect its initial commercial success. 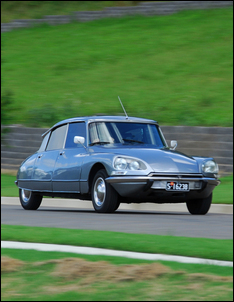 In fact Citroen was well aware that the DS might be overkill for many, and within a year released a simpler version – the ID19. 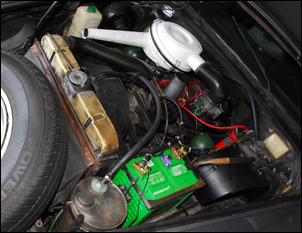 This car retained the high pressure hydraulics for only the suspension, losing the power steering, power brakes, and combined power gear selection / clutch operation. Over the next 20 years there followed a bewildering array of models – including a wagon - culminating in the 2.3 litre, EFI, DS23 Pallas. But that was in the future: back in the Fifties road testers just raved about the Citroen, albeit often in a slightly bewildered way. On normal British roads the ride is almost completely flat, with a slight vertical movement of the whole car on rough sections. Most noticeable on rough surfaces, such as cobbles or concrete strips, is a harsh patter from the tyres, attributable to the unyielding properties of the steel band in the Michelin X tyres, which are a standard fitting. It is the only discernible road noise, for in all other respects the body is particularly free from any form of drumming. Despite the use of anti-roll bars front and rear there is a noticeable degree of roll during hard cornering. This arises from the use of independent trailing links at the rear and equal length half-wishbones at the front. Thus, the roll axis is at, or a little above ground level, and despite the very low cg [ centre of gravity] the roll couple makes its presence felt. The ride is particularly good over rough country, for which the ride control lever is best set in its highest position, which raises the body an additional 6 inches from the ground. The normal suspension setting reveals a limitation in fast driving over undulating roads. Although air suspension [the car used gas over oil] has the desirable quality of a rapidly rising rate, damping on bump in such conditions seems insufficient (it is incorporated in the hydraulic side of the suspension struts). 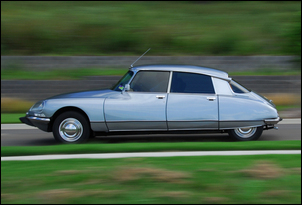 Earlier Citroen models were renowned for their good yet heavy rack and pinion steering. The Deesse retains the accuracy, but power assistance to the rack and pinion unit has removed the heaviness. The linkage is so arranged that in the event of hydraulic failure mechanical connections remain. On straight roads the car has an arrow-like stability, with sufficient self-centring on normal bends, and a complete freedom from backlash. Driven, steered wheels have an inherent stability, with freedom from road shocks except on very bad surfaces. The DS19 is devoid of shock reaction under all conditions. The lack of feed-back from the wheels means that there is no proportional feel in the steering, so that the wheel effort on a bend, irrespective of speed, is constant. This is a new concept in steering, but if the Citroen is a typical example there are no drawbacks. The self-centering is not so apparent on sharp steering locks, and this, combined with the change over of lock and the roll when negotiating fast S-bends, demanded concentration. Opinions of staff members on the braking system were divided; there was some criticism of the very small brake pad, and the extra care required to give delicacy of operation. But the brakes are extremely powerful, and controllable provided that the driver's usual method of application is modified to suit this new system. Its said that there's nothing new under the sun — but after a long day driving around in a Citroen Goddess I don't believe it. When I got home late at night after some 250 miles through scorching heat, blinding dust, and over an assortment of [the] very kind of roads N.S.W. can dish up, I was still marvelling periodically as new, amazing discoveries kept right on cropping up! For the DS19 is not only "different" — it is just about as unlike a car (as we know the term) as anything on wheels can possibly be. Look at it, and it's something that just whizzed in from Outer Space. Drive it, and the impression is heightened. And even after you've driven in it all day long, you're still finding out new things, radical things, amazing things about this car, which when it was released two years ago, at one stroke rendered all other vehicles ten years out of date, and which, even today, is still so far out in front of the herd in all things save sports-type performance, that just to ride in it becomes all over again a new experience. The rough road performance wasn’t just a figment of a journalist’s imagination, either. The ID19 won the Monte Carlo rally in 1959, while in 1966 the DS21 was Monte Carlo winner – but only after the BMC Minis were disqualified. 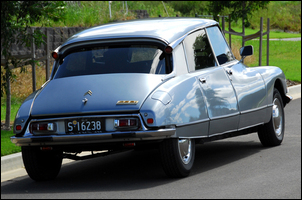 In the 1968 London – Sydney marathon a Citroen performed well, while yet another Citroen won the 1974 World Cup Rally. But time catches up with any design, and the road tests became less effusive. In a 1973 Motor test the magazine had a comparison box that pitched the DS23 Pallas EFI against cars like the Jaguar XJ6, NSU Ro80, Rover 3500S, Volvo 164 FI and BMW 2500. With the exception of the similarly radical NSU, the comparison cars were largely conventional – and so much safer buys. In summary the magazine said the good points were the car’s performance and relaxed high-speed cruising, the excellent ride and roadholding, the magnificent lights (by this time they steered with the wheels), and the cabin comfort. However, on the debit side were over-sensitive brakes (even after 20 years, they were still being criticised! ), pronounced dive and squat – especially in stop-start urban traffic, noisy hydraulic pump, and engine harshness at low speeds. The last DS models were produced in 1975. 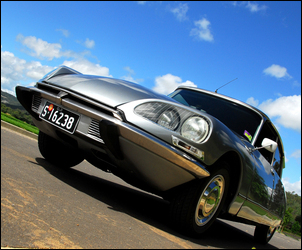 Thanks to Phil Christian for access to his 1974 Citroen DS.